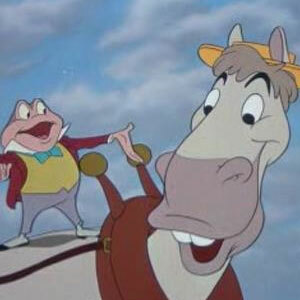 Episode 11: The Adventures of Ichabod and Mr. Toad | It's time to go to MARS and do so as FRIENDS! We’ll go for a jolly ride! Dang, there were surprisingly few moments in this show in which I could get all schadenfreude-y. Therefore, terrible episode! Naw just kdding. I enjoyed it as usual. I feel compelled to watch the movie for once, so I think I shall. You two are getting quite creative with your podcasts! I loved the Who Wants to be a Millionaire thing. Oh, and a duvet isn’t that thing that you just throw off the bed in a hotel. It is basically a comforter, but duvets have a removable cover (duvet cover) so you can take it off to wash.
That is all thanks to the awesome editing skills of Dragaroo. Also thanks for the definition of a duvet.